Effective rewards and recognition practices are one area that reflect a Space-O’s culture, basic values & beliefs and integrate well with the nature of its business, strategy and goals. It was yet another season (Checkout R&R Q1 & Q2) of the reward and recognition that was held on last week (18-Oct-14) for the quarter-3, July-September 2014. As usual the award presentation was started with great enthusiasms and claps by our employees who were all dressed in white, a great team spirit! 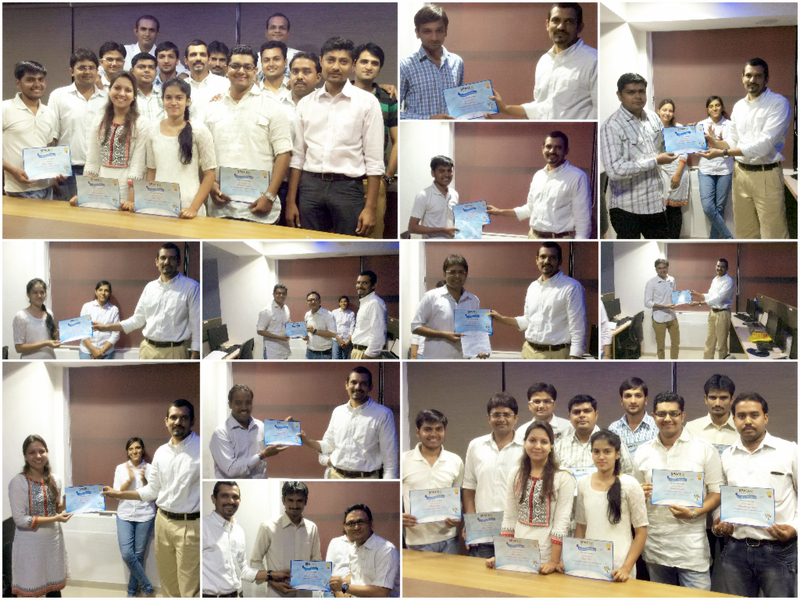 The gift vouchers and Certificates of Excellence were handed over to some of the best performers of the company by Mr. Atit Purani, CTO of Space-O Technologies. To make the environment very surreal and fun side, Mr. Chintan Modani has started R&R event by calling the top performers to receive their awards by tagging their roles to the Bollywood movies. Ting Tong the prize goes to the top three actors and hold your breath they are…. 1. Parag Ghetiya – Just like Phata Poster Nikala hero, our hero Parag received the award for his excellent work, he was overwhelmed and became emotional upon receiving the prize hence Just a Thank You note was heard from him. 3. Jigar Pandya – As seen in Burfi movie that pulls everyone with his smile, similarly our hero received the third prize, the crowd cheered him with clap and whistles, sure burfi boy! 8. HarpalSingh Gohil – The favorite of everyone in Space-O, just like go lucky Happy Singh. As a surprise award which we see quarter after quarter, two deserving candidates received this award which was solely decided by the CTO, for their commendable job that they showed not only towards the company but takes lead to be in part and parcel of all the employees’ requirement and carry out it with ease. 9. Ankit Shah – the Project Manager, who has spread his wings in almost everything, whether it is multiple roles, escalations, sales, team work, anytime of the day you call, he is always there to chase behind the work and get it done. 10. Mansi Trivedi – Joined Space-O as a Receptionist who hardly knew anything has now completely made a 360 degree change in her career in a couple of years, now commendably handles team of 140 people as HR. Leaders make or break a company and being a true leader, Mr. Atit Purani, kept his usual routine of sharing some of his leadership qualities by giving few examples; he stressed upon having to set right goals and chasing after them and about having right attitude, ignoring negative vibrations and as a deaf frog need to perceive things in a brighter and positive way, climb the hill upward rather than slipping down. His inspirational stories motivated the employees to come out of their cocoon and share their perspective and thoughts, their views on this type of RnR, their learning’s and the positive changes that their underwent after joining the company. This is one of the ways that help employees and the organisation to find out about their hidden talents and boost their personal motto of work hard and play hard attitude. Along with Atit Purani, AVP-Mr. Bhaval Patel & Delivery Head – Mr. Narendra Purohit gave more in-sight about goals, un-learn and attitude to the employees. As rightly said by Narendra, only when we try to unlearn our repetitive practice, only then we will be able to gain new things and this will help us to grow in a more positive path. Adding to this Mr. Bhaval Patel said, having positive attitude and setting goal like focused frog will leap us far ahead of everyone. These inspirational words from leaders and viewing things at the micro level are not only making Space-O environment a better place to work; also the leaders & PM are able to balance both the client and employees in same perspective and make sure that they help employees in making them to understand and play their roles accordingly with their easy approachable quality, hence employees feel there are in more comfort zone thereby enhancing Space-O to grow further.